Why? The biggest celebration for our Community AND our biggest event fundraiser for our School. Who doesn’t love a fabulous party to support our children’s education and enrichment? Held in the Spring, our annual Gala is the funnest, biggest celebration for our FSK Community! This event is a chance for us to get together and enjoy an evening of dancing, live entertainment, delicious food & drinks, and bidding at our Silent & Live Auctions. We also have a Kids’ Party for our children (FSK Students, ages 5-12 years only) at our school! 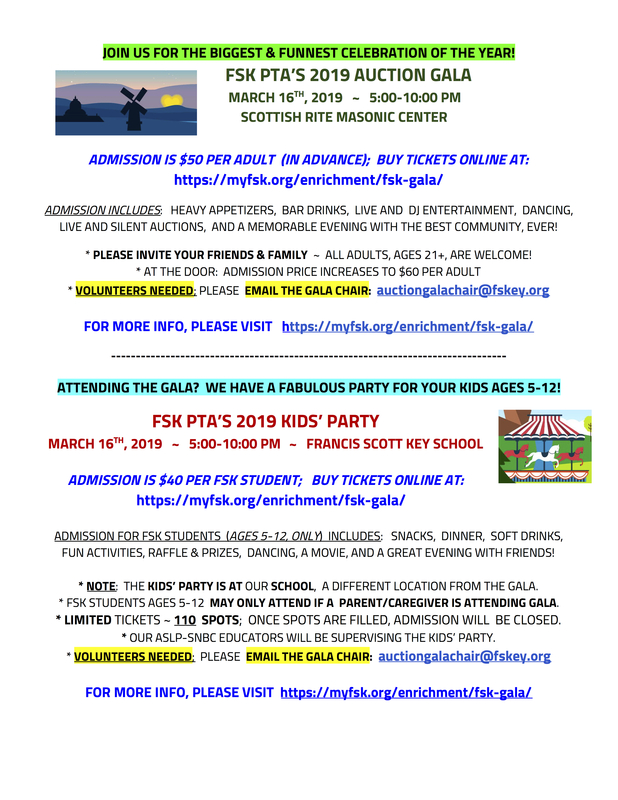 Please mark your calendars now for our Gala & Kids’ Party on March 16th, 2019! DONATIONS: Please consider donating DESSERTS for our Gala! Email the Gala Chair (auctiongalachair@francisscottkeyschool.org) if interested in donating baked goods/sweet treats. Thanks! By attending our Gala and bidding on items in the Silent and Live Auctions, you directly support the continuation of our wonderful programs and events at FSK. All the Gala funds raised go directly to our PTA to support enrichment activities and events for our students. 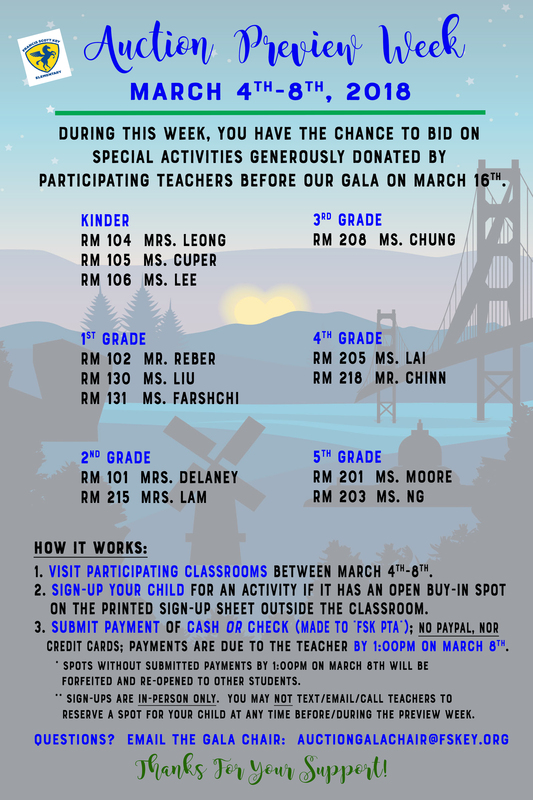 Aside from Direct Donations throughout the year, a big portion of funding for our PTA is contributed by funds from the Gala. These funds support important programs, such as Art in Action, Science Sacks, new Technology, Outdoor Education Program, and fun Social Events (Step up to Kindergarten, Welcome Coffee, Halloween Parade & Celebration, Movie Night, International Night/Passport Day, and more). Please see the Documents and Flyers below for more information on the Gala and Kids’ Party. Thank you to Angela Chang (Dylan Lee’s Mom, 1st G) for creating the beautiful flyers. 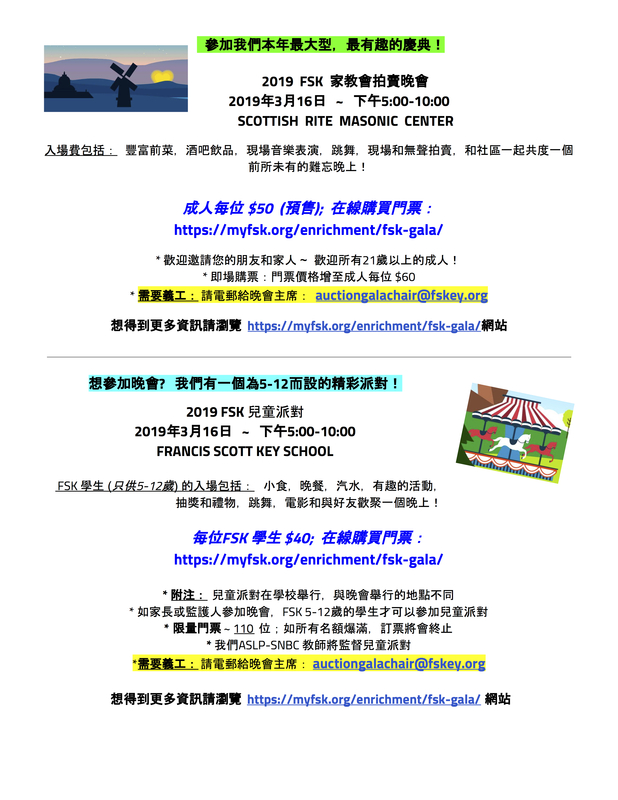 UPDATED INFO about Gala & Kids’ Party: CLICK HERE for English version & CLICK HERE for Chinese version.